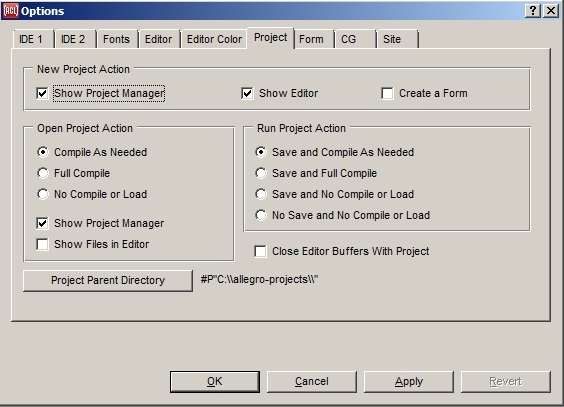 This tab of the Options dialog shows options associated with projects. Show Project Manager: if checked, the Project Manager dialog is created and exposed if it is not present already. See new-project-show-project-manager. Show Editor: if checked, a new editor workbook is created if there is not one present already. See new-project-show-editor. Create a Form: if checked, a new form is created when a new project is created. The New Form will be displayed as part of the new project creation so you can specify what kind of form to create, and the form will be added to the project. The form will be displayed and an inspector window is also created if there is not one present already, and the new form is inspected in it. See new-project-show-form. Compile As Needed: each project source code file is compiled unless it already has an existing fasl file that is not older than the source code file, in which case the fasl file is assumed to be up-to-date. Full Compile: all project files are compiled, even if they appear to have up-to-date fasl files. This choice may be useful if macros have changed or you have just upgraded to a new version of Allegro, though it may be easier instead simply to use the Tools | Full Compile command. No Compile or Load: no user-written project files are compiled or loaded. (Any auto-generated .bil files without up-to-date fasl files are still compiled, though, since this code is used to display the widgets on the project's forms.) This choice may be needed if errors in project code are preventing it from being opened completely. The two check boxes control what is displayed when a project is opened. Show Project Manager: if checked, the Project Manager dialog is created and exposed if it is not present already. See open-project-show-project-manager. Show Files in Editor: is checked, the various project source files will be opened in the Editor Workbook. See open-project-show-files-in-editor. Save and Compile As Needed: prompts for saving any modified project modules, then compiles all project files whose fasl files are not up to date, and then runs the project or form. Save and Full Compile: prompts for saving any modified project modules, then compiles all project files (whether up-to-date or not), and then runs the project or form. Save and No Compile or Load: if there are any project modules that have been modified (either by editing source code in the IDE editor, modifying widgets on forms, or adding a new module) since they were last saved to file, and the ask-before-auto-saving option is true (see Ask Before Auto-Saving on the IDE1 tab of the Options dialog), a dialog asks if you want to save the modules. Answering "Yes" saves the selected modules (all of the modified ones by default) and then runs the project or form; answering "No" runs the project or form without saving anything, and "Cancel" skips running the project or doing anything else. If there are modified project modules and ask-before-auto-saving is nil, then the modified modules are saved automatically and then the project or form is run (though canceling from the file selection dialog for a module that has not yet been saved will still avoid running the project or form). No files are compiled. No Save and No Compile or Load: no project files are saved or compiled, and the project is run with whatever project code is already compiled. Close Editor Buffers With Project: if this is checked, when a project is closed, all buffers in the Editor currently open to project files are also closed. Project Parent Directory: this button allows you to change the default parent directory for all new projects. See project-parent-directory.